This is the perfect pack for a new player to get a quick start in Warframe. This pack offers the flexibility of choosing what you want based on how you like to play. It will open up your choice of Warframes, weapons and equipment and allow you to more quickly advance in the game. 500 platinum and 100,000 credits to start stocking up on equipment immediately. 6 random Common MOD Cards to being to upgrade your Warframes and weapons right away. 4 random RARE MOD Cards for extra powerful modifications to your equipment. The Affinity Booster will rank up your equipment at a faster rate for a few days. The Credit Booster will allow you to gather credits much quicker for a few days. 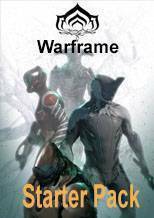 Warframe - Starter Pack Better Than 370 Plat?